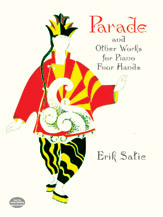 Associated with the avant-garde artistic movements of early 20th-century Paris, Satie created a "cubist manifesto" with his 1916 work "Parade." This compilation includes the celebrated ballet, plus "La belle excentrique," "En habit de cheval," "Trois morceaux en forme de poire," and "Trois petites pièces montées." Students and performers of four-hand piano music will delight in this new edition, perfect for both rehearsal and recital purposes.